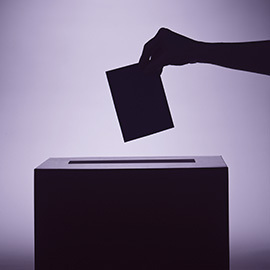 WATERLOO – Leading political science professors will gather at Wilfrid Laurier University on October 21 from 3:30-5 p.m. to analyze and discuss the results and implications of the 2015 Canadian federal election. Featured speakers from the Laurier Institute for the Study of Public Opinion and Policy (LISPOP) and Laurier’s political science department will each offer their thoughts on the election results and answer questions from the audience. Panelists will include the following experts from Laurier’s political science department: Barry Kay, associate professor; Brian Tanguay, professor; Geoffrey Stevens, lecturer; and John Milloy, practitioner-in-residence. The event will be chaired by Roy, associate professor and graduate officer. The panel will be held Wednesday, October 21 from 3:30 - 5 p.m. in the Ernst & Young Boardroom, located on the third floor of the Schlegel Centre for Entrepreneurship on Laurier’s Waterloo campus. The event is free and open to the public. Advanced registration is not required. The Laurier Institute for the Study of Public Opinion and Policy (LISPOP) is a research centre at Wilfrid Laurier University which studies issues pertaining to the creation, use and representation of public opinion in the policy process. The Institute serves as a catalyst to promote individual and collaborative research on these issues. For more information on LISPOP visit wlu.ca/lispop.